April 26, 2011, marked the 45th anniversary of Tzu Chi. From the start, the foundation has been carrying out its missions to purify minds and save the world. To save the world, one must begin by transforming people’s minds. The Dharma, the Buddha’s teachings, can cleanse our hearts and minds and therefore serve as a good remedy for the ills that plague us. That’s why I encourage people to learn about the Dharma. Only when our minds are purified will the nurturing Earth itself become purified. This will in turn lead to a world free of disasters. I’m grateful that for over four decades our volunteers have been emulating the Buddha’s heart and carrying out my missions as their own. They have diligently walked the Bodhisattva Path and have relieved people’s suffering with compassion and love. The only way I can repay their love is to guide them to deeply reflect on the Buddha’s wisdom and truly take his teachings to heart—this is a good way to overcome ignorance, cleanse away spiritual impurities, and grow in wisdom. Tzu Chi was founded in 1966. At that time, the population of Taiwan stood at about 8.5 million people. Now, 45 years later, the number has grown to 23 million. The world’s population has risen to nearly 7 billion. More people means more desires, wants, and cravings in the world. Such huge populations make our goal of saving the world by purifying minds even harder to achieve. Within every heart there is a pure wellspring. If only a few people know to use this resource, we cannot transform the hearts and minds of humanity fast enough, especially given the world’s rapid population growth. We must inspire and guide more people to tap into the wellsprings in their hearts. This is the only way we can attain our goal of purifying all minds. 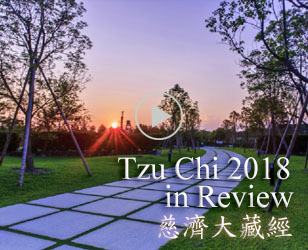 Forty-five years ago, Tzu Chi came into being with the mission to “purify people’s hearts and minds.” That’s not just a slogan, but a goal towards which all our volunteers must strive. This concept, like the Buddhist sutras, is meant to be practiced in daily life, not just chanted. In the hope of awakening the untainted Great Love in people’s hearts and guiding them onto the Bodhisattva Path, I established the four Tzu Chi missions of charity, medicine, education, and culture. Later, I extended these to include bone marrow donation, international relief, environmental protection and community volunteerism. Together, these fields of endeavor are called the Eight Footprints. I thank all those early volunteers for spearheading our efforts and opening up and paving the Tzu Chi Path with love. Like laying interlocking paving bricks, they made a rugged path smooth and easier for those who followed in their footsteps. Today, our world is experiencing global warming and is beset by disasters. Therefore, I urgently call upon everyone to repent of their wrongs, take up a vegetarian diet, purify their minds, and inspire others to do the same. This is the only way we can help keep disasters away. An ignorant thought can easily lead to worries and afflictions. Such worries and afflictions may seem tiny and subtle at first, but they can accumulate like specks of sand growing into a desert, and obscure our innate pure nature. When our innate nature, which in its original state is as bright and clear as a mirror, becomes obscured by mundane worries, then it won’t be able to reflect the truths of the world for us to see, and it will be unable to guide us onto the right path in life. The Dharma is like water: It can cleanse the dust of affliction from our minds. The Dharma teaches us that we must be careful not to sow seeds of bad karma or form bad ties with others, for retribution is sure to come. In our daily life, we must constantly reflect on ourselves and repent of any wrongs we have done. Doing so allows the Buddha’s teachings to penetrate our heart and to wash away impurities from our mind. That way, the mirror of our mind will become polished and bright enough to reflect the truths of life for us to see. Only then can we see clearly that nothing in the universe lasts forever, and that things come and go according to the convergence and divergence of conditions. Every one of us has the same innate pure nature as that possessed by the Buddha. As Buddhist practitioners, we must bear the Buddha’s spirit in our heart and put his teachings into practice. We must be mindful of our every thought. If we don’t, we might unwittingly sow bad karmic seeds. For example, if you accidentally bump into someone, but instead of apologizing you blame the person for getting in your way, then you create bad karmic affinities. Many people know about impermanence and talk about it. But how many truly realize that impermanence happens due to the coming together and falling apart of karmic affinities? Take human relationships for example. When affinities arise, people come together; when affinities end, so do their relationships. Those who truly understand the nature of impermanence treasure every chance to form good relationships with others. We all know, “It is easy to have an aspiration but hard to follow it through.” Though it’s easy to awaken our innate pure nature, it’s difficult to hold on to it and to persistently practice the Buddha’s teachings in our daily lives. We must therefore constantly use the water of the Dharma to cleanse our hearts and minds so that our true nature isn’t obscured by our habitual tendencies that cause afflictions to arise. A major earthquake hit northeastern Japan on March 11, triggering a massive tsunami, fires, and a nuclear crisis. Months have passed, but the crisis continues. The road to complete recovery is still very long. When can people there return to a normal life again? My heart aches when I think of their suffering. 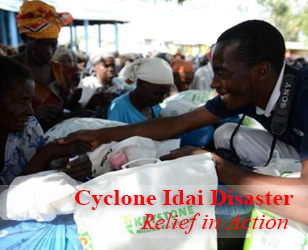 The frequent disasters in the world are alarming messages sent to us by the earth and heaven. We must take such warnings to heart. To end such multiple disasters as those that happened in Japan, we must learn to cultivate multiple spiritual merits—by remaining vigilant and sincerely pious, by repenting of our wrongs, and by practicing vegetarianism. To repent, we should first clean impurities from our minds. Then the stream of purity in us will flow out and purify others. We ourselves must repent before we ask others to do the same. When we maintain a vegetarian fast, we must do so piously and sincerely. Otherwise, though it may bring benefits to our physical health, we will not grow in virtue. When we can live vigilantly, maintain a repentant heart, and piously abstain from meat and refrain from taking life, we will be able to cultivate multiple merits of compassion and wisdom to safeguard the world. Natural disasters, however massive, eventually come to an end. What we really need to be wary of is the ignorance and anger in our minds. In ignorance, people revert to their unwholesome habits and create more bad karma for themselves. To avoid this, we must purge mental toxins from our minds. The longer we allow such filth to remain in our minds, the harder it is to wash it away, just like stains on clothing. Not only that, but it also reflects badly on our character. When we truly repent of our failings, we will be able to wash away the five major sources of mental afflictions: greed, anger, ignorance, arrogance, and doubt. Such mental impurities, if allowed to converge and come together, cause a ferocious karmic force to arise that can destroy the peace and safety of the world. This is why it is so important to take care to reflect on ourselves and repent. Practicing repentance means more than just chanting sutras or bowing to statues of buddhas or bodhisattvas for forgiveness. Instead, it is about keeping our minds broad and pure and dealing with others with understanding, accommodation, and love. Those who are sincerely repentant will feel a liberating sense of peace; on the other hand, those who cover up their mistakes and are unwilling to repent will be weighed down by worries and afflictions. To further help ourselves become pure in mind and body, we must cultivate moral discipline, samadhi (deep concentration), and wisdom. Practicing moral discipline is like wearing protective armor—it keeps us from being easily influenced by outside circumstances and falling into traps. With moral discipline comes samadhi. With samadhi, our minds will be focused and clear and we won’t deviate from the right track. The third attribute, wisdom, will naturally arise within us when we have moral discipline and samadhi. When we possess these three characteristics, we’ll be able to walk a smooth, broad, long-lasting spiritual path. Over 2,000 years ago, the Buddha said, “In an era of turbidity, living beings have a lot of impurities.” Look at today’s society: Many people are ignorant and deluded and laden with afflictions. They cannot distinguish right from wrong or good from bad. They have no sense of ethics and feel no shame when they do something wrong. With so many impurities residing in peoples’ hearts, we’re living in an era of turbidity. With so many people creating negative karma, our world cannot be at peace. Bad karma can be created in thought, word, or deed. Everyone must therefore wake up, reflect on themselves, change their wrong ways, and return to their pure innate state. Let us not allow our ignorance to grow and take our negative karma into our next life. I hope everyone can encourage each other to diligently absorb the Buddha’s teachings. If we can cleanse our mind with the water of Dharma, reflect and repent, break our bad habits, and get rid of our ignorance, we will naturally live in spiritual joy. When everyone has a peaceful mind and is free of afflictions, positive energies will prevail and our world will prosper in peace and safety. Everyone makes mistakes. When we do something wrong, the best thing to do is to quickly repent and change our ways. However, many people do not do that. As a consequence, delusions and afflictions accumulate in their minds and their hearts become polluted. It’s easier to see a smudge on other people’s faces than it is to see a smudge on our own. Likewise, it’s easier to detect others’ wrongs than our own. I hope everyone can turn a mirror on themselves and wipe away the dirt they see. Remember that when an evil thought arises, one’s life can be plunged into darkness; similarly, when a good thought surfaces, light can be restored. Liao Kun-yong (廖坤永) is a volunteer at a Tzu Chi recycling station in Nantun, Taichung, central Taiwan. He became addicted to drugs at a young age and was jailed six times during his 20-plus years of addiction. But all that jail time did not bring him to his senses. He even used the gifts of money that friends and relatives had given his family at his father’s funeral to buy drugs. Because much of his life was spent in prison, he felt alienated from society. Fortunately his mother never gave up on him. One day, a friend of his mother’s, Zhou Su-e (周素娥), a Tzu Chi volunteer, began to write to him in prison. She wrote him encouraging letters and sent him a copy of Jing Si Aphorisms [a collection of maxims by Master Cheng Yen]. She even sent him some pocket money. Touched by her warm care, he decided to kick his drug habit. When he was released from prison, he went to a Tzu Chi recycling station to help. Volunteers extended their care to him and even helped him find a job. Slowly, his sense of alienation began to dissipate. If Liao had not reflected on himself and repented and reformed, he might have continued to make mistakes and created havoc for himself and others. But when he was in a tug of war between good and bad, it was the efforts of the kind people around him that pulled him to the good side and helped him begin a new life. Such living bodhisattvas as these dedicate themselves to helping others in times of trouble and then inspire and guide them onto the right paths. They help to cultivate good people and bodhisattvas. In life, we should all vow to be living bodhisattvas and to help others in times of need and trouble. If we can all act with a kind heart, treat others with love and understanding, and help relieve suffering, our world will naturally be peaceful. By giving of ourselves and living in harmony with others, we will realize the truth of this saying: “Those who are blessed derive joy from doing good deeds; those who are wise attain freedom of the mind by being understanding toward others.” Walking on the right path will always result in a state of joy. The Dajia Mazu pilgrimage, held in the third month of the lunar calendar, is one of Taiwan’s most celebrated religious and folk festivals. According to folklore, Mazu, the goddess of the sea, was born as Lin Mo-niang (林默娘). She was a kind, pure-hearted girl and a very good daughter. One time her father encountered a great storm while fishing out at sea. Worried about him, she knelt on the beach praying. Some legends say she even jumped into the sea to save her father. Her filial piety moved the heavens and calmed the seas. In remembrance of her virtue, fishermen deified her as Mazu and built temples to worship her. The worship of Mazu has been popular in Taiwan for several hundred years. When the goddess goes on her annual pilgrimage, devotees line the path where her procession passes by and eagerly await her arrival. When the palanquin graced by a statue of Mazu passes, worshippers struggle to get close enough to touch the palanquin, an act believed to bring blessings. To show their sincerity, believers also set off enormous amounts of firecrackers along the way. True worship should be about emulating the virtue of a god or goddess. In the case of Mazu, we should learn from her filial piety and her righteous conduct with a pious heart and respectful attitude. However, this does not seem to be the case. Nowadays many people worship the goddess only because they want her blessings as a way to gain wealth or fame. With such self-interest clouding their minds, the meaning of true piety is lost. For 13 years now, Tzu Chi volunteers have followed crowds of Mazu worshippers and picked up the trash they leave behind. They also promote the concept of no littering to the worshippers. As they bend down to pick up the garbage, it is as if they are on a bowing pilgrimage. In the process, they not only take care of the Earth, they also purify their minds and hearts. To have peace and safety in life, we cannot ask only for the blessings of gods or buddhas. Instead, we must follow the laws of nature and moral ethics and do our best to benefit humanity and care for the Earth. Only then will we enjoy peace, safety, and harmony. At night, the stars shine brightly, bringing peace and quiet to the world. It was during such a peaceful night over 2,000 years ago that the Buddha, gazing at the stars, attained enlightenment and comprehended the truths of the universe. In the same way that the stars light up the sky, there is also light in each of our hearts; like the stars in the sky, the light in our hearts can also bring a sense of peace and harmony to a long, dark night. However, this light—the crystal-clear, bright, innate buddha-nature—is often obscured by impurities, allowing ignorance to grow unchecked. It’s a long and arduous journey to cleanse such impurities from our hearts. But as long as we have the innocence of a child, the endurance of a camel, and the courage of a lion, we will be able to return to our innate wisdom, which is commensurate with that possessed by the Buddha. The Sutra of Immeasurable Meanings teaches that drops of water, the Dharma, can dampen the dust of desires. If we can absorb even the smallest drops of the Dharma water at all times, we will be able to gradually nurture our minds. The beginning of a clean world starts with the pure wellspring in each of us. The Compassionate Samadhi Water Repentance can help us negate the bad karma we create through our thoughts, words, and deeds. That’s why I hope everyone can take its teachings to heart. 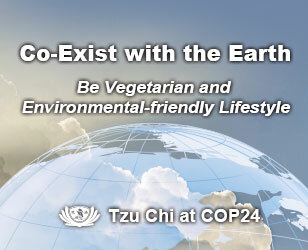 It’s my wish that everyone can repent of their wrongs, adopt a vegetarian diet, and live an eco-friendly life. If we can all return to a simple, frugal lifestyle, purify our bodies and minds, and further inspire others to do the same, we will be able to safeguard the land on which we live and the Pure Land in each person’s mind.
" One who is content is immensely broadhearted. A broadhearted person will not be in dispute with others over any matter. "